Which is quite a change and what Baroness Vadera, working in a role titled "Business Minister" in the UK, claimed to be referring to a couple of days ago when she admitted seeing "little green men" "green shoots" of recovery (interview here plus entertaining video report on it here). Never likely to be confirmed suspicions suggest that Prime Minister Brown immediately requested the Baroness reduce her daily intake of seven cups of coffee. Which may prove a challenge for someone with 14 years experience of the hallucinatory UBS culture, a suspected stronghold of excessive caffeine inbibation. But back on track, and keeping with the theme of the previous post, the picture looks more stable than before thanks to central bank interventions. Or it does in relative terms. Yet compared to pre-summer 2007 normalcy it is not. Still, other things being equal, a smaller spread means perceived default risk is dropping. However, do you not wonder - given those same central bank actions - that because wholesale money markets are surviving on public finance life support systems that the risk such spreads once measured has not declined (or not by as much as the graph suggests) but merely been steadily transferred...elsewhere? 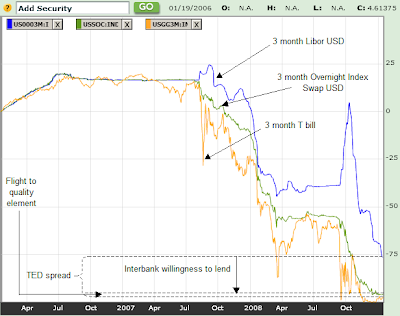 In the same way the Baltic Dry Index lost proxy status for global sea-borne trade once China started flooding the world with steel from 2006, the TED and Libor/OIS spreads are, perhaps, less informative risk indicators than before. The urgency with which capital raising continues alongside further mooted injections of taxpayer money into banks, anecdotally at least, may also be suggesting as much.